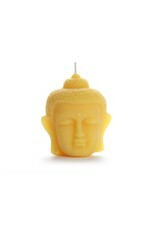 This 100% pure beeswax Buddha Pillar makes the perfect gift for yourself or your enlightened friends. A creation by in-house artisans, this candle casts a luminous glow through its unique design. Each candle is 4.25" tall by 3.5" wide and will burn for 40 hours.